This guide will teach you how to build a home from a house plan, step by step. Building a house can be a daunting task. There are thousands of choices to make, all of which will affect the home that you plan to live in. And let’s face it, most of us don’t know the first thing about building a home or choosing a plan. So, if you’re feeling a little overwhelmed, don’t worry. This guide will take you all the way from choosing a house plan that is right for you to pulling the trigger on building your new home. Our goal is to give you a guide that takes out all the guesswork – from start to finish we’ll help you build your dream home. We have assembled a to-do list below that you’ll need to complete in order to build your home. For your convenience, we’ve made it like a table of contents for this guide. If you are further along, or come back later, you can simply click on the link below of where you left off and it will take you to where you need to be. 7.1 What Types Of Modifications Can I Make? 7.2 How Much Does Modifying A Home Plan Cost? 7.4 What About Mechanical, Plumbing, and Electrical? Stock Plan – A stock plan is premade plan for a house that allows the buyer to build the home at a site of their choosing. Bid Set – A bid set is a full set of plans that allow you to obtain a quote from a builder. However, they typically do not come with a license to build the house. They typically come in PDF form and are called PDF Bid Sets. # Set – (e.g. Five Set or Eight Set) These are simply multiple plans that you can use to give to builders and contractors. They typically include a license to build the home as well. PDF Set – A PDF Set, not to be confused with a PDF Bid Set, is a full electronic copy of your plans in PDF form and include a license to build the house. Some sites do not offer these. AutoCAD – An AutoCAD file, also known as a CAD file, is the original electronic file of the plans. Having the AutoCAD allows you to make edits to the plans which you can then give to your builder. They typically come with the .dwg or .dxf extensions. Vellum – Vellum is actually a type of translucent paper which makes it perfect for storing hard copies that last a long time. It’s the standard ‘architecture’ paper that most people think of when they think of architects. Bond Paper – Bond paper, or bonded paper, is regular paper and can come in different thicknesses or weights. Think of it as thick(er) paper. Foundation – The foundation of a house is what the house rests on. Slab – A slab, also known as a concrete slab, is a type of foundation. Crawl Space – A crawl space is a type of foundation that is built on beams, stilts, or pillars and has open space where you can crawl. These are used in places where slab foundations would not be suitable. Basement – A basement is also a type of architecture foundation that you may be able to choose with certain plans. Redlining – Redlining is a type of architecture plan modification that allows an architect to modify a plan without having to rebuild the plan itself. It is typically the cheapest form of plan modification but can only be used for minor changes. The first step is to sit down and decide what your wants are and what your needs are for your house. For instance, you may have two children who need to have their own rooms, however, you may want to have a game room for them to play in. In other words, decide what is negotiable and what is not. Just as when you go look at houses in person, house plans can lack things that you may need. So by deciding what it is you need you can quickly go through what is appropriate for you. The main differentiators of a house plan are the bedrooms, baths, and garages. These are the most typical needs for most families, so that’s how most plans will be sorted. So you’ll want to determine what you need for each. How many bedrooms do you need? Will your children share a room or have their own? Do you need a guest room? Write down the bare minimum of rooms that you require. How many bathrooms would you like? Does each bedroom need to have its own bathroom? Can your children share a bathroom? How many half baths do you need for living areas? How many cars do you need to have in a garage? Do you need a garage at all? Do you need extra space in your garage for an awesome man cave? You may or may not already have a lot in mind for your house. If you do, you’ll need to make sure that the stock house plan that you choose will work on that lot. If you don’t already have a lot in mind you’ll just need to be aware of the costs and size of the house you plan to build if budget is a concern. We suggest looking around in your desired neighborhoods, or locations, and get some initial quotes for plots of land to get an idea of what it will cost. Make sure your lot fits your house. You’ll want to account for desired yard space in case you don’t like having your house on the edge of your property. There are also various codes for how much space is required from the edge of the lot to the house depending on what state you live in. HOAs, as we’ll see below, can also set rules about this. You’ll need to account for the shape of the lot compared to the shape of your house. Simply buying the same square footage doesn’t mean that the house will fit in your lot. Make sure you get dimensions of both your lot and house plan so you can make sure they are compatible. A sloped lot can cause some unique challenges for builders that you should be aware of if budget is an issue. Depending on the angle of the slope, you’ll have to have a thicker foundation or perhaps even a combination. If this is the case, you’ll likely have to have the foundation plans modified by a contractor. The type of terrain and your location can affect what type of home plan you choose for your lot as well. For instance, if you live on the coast and hurricanes are an issue you may want a crawl space for flooding. If your area has unique challenges such as this, talk to a few builders to get an idea of what type of plan to buy. Now that you have an idea of what you need and what type of lot you’re likely going to use, you can move on to choosing a style for your house plan. Before purchasing a style, there are a few things you need to consider. If the lot you want to build on has an HOA, chances are they have guidelines on what can and cannot be built there. Many HOAs will restrict the style of houses so that the neighborhood looks similar. This is typically done to protect the value of the houses in the neighborhood. But you’ll need to know this before buying a plan in case your Modern Art Deco house doesn’t fit in with the Italian Style houses of the rest of the neighborhood. Be sure to contact the HOA to get these restrictions as well as any others they have put in place. A lot of people don’t think about this, but your city may have ordinances in place that can affect what type of house you can build. These are typically items such as how many buildings can be built on a lot (in case your desired plan has a small cottage for Granny). There are also code restrictions that vary by city and state that you’ll have to adhere to. In order to figure these out, you can contact your local government’s Code Department or ask a builder what specifics you’ll need. If your plan is not up to snuff you can always have it edited later as long as you have the AutoCAD files. For your convenience, we’ve selected a handful of popular styles to get you started. In the next section, we’ll go over where you can find actual stock plans and give you some recommended sites. Farmhouse house plans are very popular at the moment. These houses are rustic in design but modern in construction. They typically have porches, barn door garage doors, and are often wider in dimensions. They are great country house plans as they typically require larger lots. Modern house plans are houses with square dimensions, with white solid outer walls, and lots of glass in the design. These are the types of houses you’d find on the beach in Beverly Hills or luxurious parts of the city. Contemporary houses are similar in design but harken back to the designs of the 60s, 70s, and 80s. Italian house plans are making a strong surge right now. They typically feature rock wall exteriors, high towers, and angled rooftops. These plans have large, open rooms and modern, open kitchens. A great example of this would be our Pleasant Forest model. 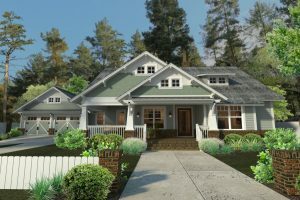 Craftsman house plans are plans that offer simple forms, but have lots of handcrafted wood and stone. Put bluntly, these houses look like they were handmade by a master craftsman. You can expect lots of nuances to these homes in terms of breakfast nooks and unique open kitchens. Around the country, a lot of home designs have become local favorites. In the South, plantation style are popular, but in Texas a lot of stone is used because it is so plentiful. However, most plan sellers don’t advertise their plans as a ‘Southern’ or ‘Texas’ house plan. So we’ve written up what styles to look at for each region to help you get started in the right direction. 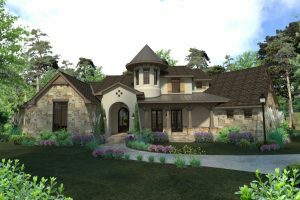 Texas house designs are unique in that they showcase a lot of stone; especially limestone. They are typically larger houses as well do to lot sizes being larger than average and the price of building a house a little less than the national average. Some popular styles to look at for Texans are Mediterranean, Farmhouse, and Craftsman houses. Southern house designs typically include large wrap-around porches and large pillars that harken back to the southern plantations. Expect the exterior to be wood or brick and windows to have large colored shutters. 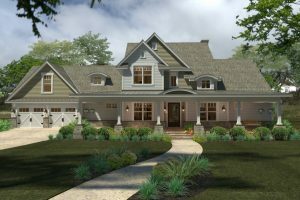 Some popular styles to look at for a Southern house design would be Colonial house plans, Craftsman houses, and Classical Houses. Northeastern house plans, also known as Maine house plans, are typically rectangular in shape, have lots of white wood on the exterior, and porches on one side of the house are common. The houses are smaller which reflects the region’s scarcity of land but they are very charming. Some styles to look at for Northeastern home designs would be Colonial, Craftsman, and Classic homes. 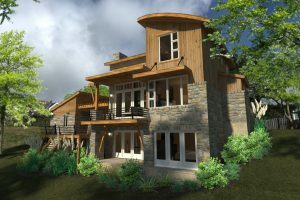 Southwestern home plans are unique in their designs. They typically feature stucco exteriors and, more often than not, have a single story which relates to the native stucco homes that were built hundreds of years before. They are perfectly adapted to the Southwest’s hot and dry climate. When you’re looking for homes in the Southwest simply look for Western, Southwestern home plans. If you live in the region’s more mountainous areas you may look into Log or cabin home plans. Most people wouldn’t think that, but they are! If you compare houses with the same square footage, the single story house will almost always be more expensive. This is because a two story house shares the foundation and roof for both stories. So less of both are required. These are often the most expensive parts of the house so the less there is the less they will cost. If you know that your budget is tight, you should plan ahead accordingly. Don’t get the house plan with the two extra bedrooms and a game room. A lot of house plans providers will allow you to buy a downloadable PDF Bid set that you can get a ballpark quote with. You won’t be able to build the house because you need a license to do that. But you can cheaply get a quote. This makes buying a few plans to quote a lot easier on your bank account. If you’re not sure if the house is perfect buy the Bid Set first and then buy the full plan later. In this section, we’ll walk you through purchasing your stock plan so that you can avoid mistakes and confusion. There are a lot of little pitfalls to be made so follow this section closely. Below is a list of our recommended sites. These are people that we know and trust. You can purchase from the large aggregator sites, and many of these designers sell on those sites as well as their own, but we recommend buying directly from the designer. Doing so allows you to easily get information and modify plans if needed. It also puts a name and face to your plan which is always fun! If you just want to get a quote for the house, get a PDF Bid Set. This will allow you to get a quote. Once you get a quote and know that everything matches up you’ll need to purchase a set of plans which typically come in either 5 or 8. These are not Bid Sets. They are full on plans that include a license to build the house. If you need to make alterations or modify the plans, then you’ll need to purchase the AutoCAD files. We’ll go over modifying the plans in the next section. If you’re not sure of what you need to buy talk to your builder and to the designer to make sure that you don’t waste money on something you don’t need. When you purchase an actual plan (not a Bid Set), you will receive a license to build the house. Without a license, you will be building the house illegally and will have to pay fines or worse. So make sure you have this before proceeding. The foundation plan shows the plan and design for the foundation of your house. The plan will either be a slab, crawlspace, or a basement and will include details such as footing layout, posts, beams, and other structural elements that are a part of your plan. The floor plan will show the plan’s dimensions for rooms, doors, windows and walls from an aerial (looking from above) perspective. The roof plan will show the roof’s structure and shape as well as what type of roofing material should be used. It will also indicate where the chimney is, if there is one, as well as any other decorative elements in the roof’s design. Exterior Elevation plans are side shots of the house that show the height of the house as well as roof pitch degrees. It will also show what material should be used for the exterior of the house. These are like an MRI of the house from the side. They are essentially the house split down the middle to show interior heights and angles of the ceiling. The electrical plans will show where fixtures, outlets, and switches should be located. These are typically not full electrical plans that show where wiring should be laid as that is usually dependent on your local code. Your builder, or contractor, should be able to determine where and how this is done without detailed plans. These plans show nuances of the plan’s design such as porches, stairs, roof details and more. **PLEASE NOTE** – This may vary depending on the designer. We’ve placed an asterisk (*) on the above sections that are optional. If you have ordered a plan and believe you are missing a part of it check with your builder and designer. The number of copies of your house plan you will need vary depending on your circumstance. It surprises many that most designers won’t allow you to make copies of your plan yourself. Copying house plans can actually be illegal depending on the designer’s contract and terms of service. So please make sure you check with your designers before copying anything. Most designers will not allow you to have an electronic copy of the plans unless it’s an AutoCAD file. This is to protect their hard work in making the plan and prevent others from stealing it to either monetize it or not have to pay for it. Most plans will be mailed directly to you. You will typically need between 5 – 10 plans in order to have your house built. You’ll have to give plans to your builder, to the local government, and other parties to have your house built. This is why most home stock plan providers offer 5 and 8 Sets and then offer individual plans from there in case you need them. In order to figure out how many you need, talk to your builder. There’s a good chance that the stock plan you have will need to be modified due to local codes and ordinances, HOA rules, and maybe your own desires. If you find yourself in this situation you have a few options. You can contact the designer directly and ask them to modify it for you or you can hire a third party to do it. Some builders/contractors will be able to do this as well. What Types Of Modifications Can I Make? Really, the sky’s the limit if your budget fits (see the next question for costs). You can modify everything from small code changes to removing everything and rebuilding the house around the kitchen you love. However, that can become extremely expensive. As a general rule, most people will want to buy a plan that is almost perfect and make adjustments to that plan. If you are only making simple changes, then look into what is called redlining. Redlining is when you use an existing plan and make modifications in red ink. It’s typically the cheapest method of plan modifications. However, if you want to do more than move just a window, or expand a room by a couple of feet, you’ll need to have the plans adjusted. How Much Does Modifying A Home Plan Cost? The cost to modify the plan is typically not prohibitive and your house plan designer, or third party, can give you a quote on how much it will cost to change the plan. Expect to pay a couple of hundred dollars for minor changes, five hundred to a thousand dollars for small changes, one thousand to two thousand for medium changes, and then over two thousand for large changes. If you need to modify your plan for local codes, chances are that your designer won’t be able to do it simply because they won’t be familiar with the codes. You’ll be better off finding a local architect to make changes to the plans. What About Mechanical, Plumbing, and Electrical? Detailed mechanical, plumbing, and electrical plans are typically not included and you will likely not need them. These will be done by your Builder, or Contractors, and will vary depending on the local codes of where you live. In order to modify your plan, make sure that you have the AutoCAD files. If you do not have the AutoCAD files for your house plan then you’ll need to purchase them. Once you’ve bought your stock home plan or PDF Bid Set you can get a quote on a house. We recommend getting quotes from 3 to 5 builders in order to get a range of offers. This will allow you to see how much your house will cost based on demand instead of letting one builder set a price. We recommend not choosing the highest or lowest bidder but the decision is up to you (obviously). Having this upfront will allow your builder to get back to you quickly with a bid. A lot of the mainstream builders will not build a home that is not of their designs. So you’ll have to look around for a company that will allow you to do that. We’ve found that the greatest resource for that is your local NAHB (National Association of Home Builders) and getting a list from them. The last step is to pull the trigger and build your home! After this, the process for building a home with a stock plan is identical to building a home in a new neighborhood. We hope this guide serves you well. If you have any questions, send us an email or ask them below in the comments. We’ll continue to update this guide to match growing trends and improve it. Lastly, if you found this guide useful, would you mind sharing it on social media for us? Simply click here to share it on Facebook and here to share it on Twitter. The more people who read this article, the more our community will grow which will enable us to create even more content to help those who are looking to build their dream home. The social icons on your screen make it really easy to share as well.